It's hard to build faith in government when it's failing at everything. Starting around the late 1800's, a group of political activists who called themselves "progressives" decided that ordinary people weren't smart enough to run their own lives. They were convinced that people sholuld follow instructions from their betters. Feudal lords had the same attitude towards their serfs back in the Middle Ages.. Most Americans were independent-minded enough not to appreciate being told what to do; progressives knew that they needed the force of law and the threat of fines or imprisonment to compel people to do what was good for them. In order to get that power, they needed first to persuade people that their motives were pure and modern, and that they would bring about scientific efficiency and good government for the benefit of all. The reality is quite different, as we see a century and more into the progressive era. We see a perfect illustration of progressivism in Vice President Joe Biden's assertion that all great ideas for the past century came from government. President Obama's speeches show that he believes that the government is the preferred source of all good for all people, whether citizens or not. Liberal politicians blithely assume that if they write enough 1,000-page laws, the bureaucracy will carry out their good intentions perfectly, all for the greater good. Lawmakers expect to benefit, of course, because grateful citizens will re-elect them. Over the last 20 years or so, however, it's becoming more and more obvious that our government can't do anything well, not even deploy a web site or get the Pentagon and VA hospital computer systems to communicate. Repeated, expensive, deadly failure makes it hard for liberals to claim that their programs will benefit anyone other than more government employees and assorted lobbyists. The report "A Nation at Risk," which pointed out grave flaws in our public education system, was published in 1983, more than 30 years ago. Since then, innumerable new programs have been started and real education spending per pupil has more than doubled. In spite of all the sound, fury, and spending, educational outcomes have gotten worse. Entrenched interests have screamed about an imaginary lack of funds for so long that it's become a joke, yet wherever any truly revolutionary experiments like vouchers are tried, they're shot down with maximum prejudice. During the Obamacare debates, the New York Times repeatedly cited the Veterans Administration as an example of how superbly government would run our health care system once those obstructionist Republicans were bulldozed out of the way. They were wrong. We now know that VA bureaucrats falsified wait time records to receive performance bonuses. As many as 40 veterans seem to have died while waiting for treatment that they could have received at nearby private hospitals if only the VA had admitted that they'd waited too long. These problems go back decades. There have been 19 official reports on substandard VA performance since 2005. Before he ran for president, Senator Obama criticized Mr. Bush for mismanaging VA health care. He promised that, when he became president, he'd do something about it. And he did: not only did he increase the health care budget by 76% while the number of veterans went up 18%, Mr. Obama also ordered the VA to cut wait times. Unfortunately, it was simpler for the bureaucrats to falsify records to collect bonuses than to actually reduce wait times, just as teachers found it was easier to collect bonuses via false student test scores than to actually teach the material. Bureaucracies do what you inspect, not what you expect, and they'll dummy up what they think you'll inspect if they can figure out a way to get away with it. End result: more money spent, less achieved. Expensive failure is not unique to the federal government. 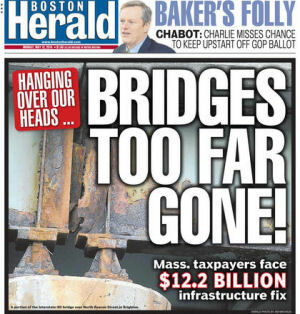 The Boston Herald reported that the state of Massachusetts has allowed so many bridges to fall behind on maintenance that they need billions of extra dollars to catch up. The Herald documented their story with a photo of a bridge which badly needs maintenance. The bridge is failing because the metal is rusting away. Why is the metal rusting? Because it hasn't been painted. Keeping a list of all the bridges in the state and knowing roughly how fast the paint falls off each one is the sort of task in which a bureaucracy should excel. Indeed, the Herald was given a precise count of all the highway bridges in the state. Although the Massachusetts bureaucracy can count bridges, it can't paint them on a timely basis. This isn't rocket science. A century ago, a painting crew started painting the Brooklyn Bridge. By the time they finished, it was time to start over at the beginning. Painting the Brooklyn Bridge is a constant job, another thing bureaucracies both excel at and love to create. Highway bridges are slightly different in that, while you may have a permanent crew of painters, you have to know when and where to send the crew to paint each one. If the Massachusetts transportation workers are anything like Chicago sanitation engineers, they put in 4 to 6 hours per day instead of working the 8 hours they're paid for. Instead of reorganizing the department, contracting out the maintenance, or buying a giant bridge warranty and maintenance plan from a major construction firm, the Massachusetts legislature decided to pour more money into their demonstrably incompetent bureaucracy by raising the gasoline tax. In the meantime, the bridges are still rusting away, and it wouldn't be surprising if one of them fell down. Instead of admitting fault, the bureaucracy would scream about inadequate funding, just as they did when 3 kids in state care were raped or killed. We've seen a few brief examples which show that our modern government can't do simple things which our government was perfectly well able to do 50 or 100 years ago. None of these will be particularly new or surprising to regular readers of Scragged, so why did we bother? You'll find out in the next article in this series, where we explore the common elements of these problems and why we can't expect workable solutions in the current political climate. Biden: Every Great American Idea "has required government vision and government incentive"
MORE OF THE SAME. SAD. WILL IT EVER END? I GET THE FEELING THAT ITS RAMPING UP IF ANYTHING AND IS THE NEW NORMAL. THANKS TO WILL FOR CONTINUING TO REMIND US. There's two America's now. The other side doesn't WANT it to end, Dave. They like it. Power and superiority are better than money. See Sandy Springs, GA for the example of how government should be run. More and better services, lower taxes, lower unemployment. etc. Why? Government services have been contracted out to the private sector. There is a solution right before us. Incidentally, Sandy Springs is not a little one traffic light town, it is part of metro Atlanta so if they can solve these problems in the midst of a progressive mentality so can other cities. I've a friend whose company paints bridges. He tells me that the Massachusetts problem is that they don't paint often enough. The rust protects the metal after it gets thick enough. So what do they do? They sandblast off all the rust and then paint it. The paint falls off because they don't fix it soon enough. with the rust gone, fresh metal rusts. The way Massachusetts does it is worse than not painting at all. I read an article some years ago about how they encourage good performance from the government run health care system's hospitals in England: they provide bonuses for admitted patient survival rates. So what do they do there? If you have a malady with a mortality rate that the workers think will likely result in your death and so result in a reduction in their annual bonuses, they refuse to admit you or treat you. Because they aren't measuring the mortality rates of people who ASK for care, only for those who RECEIVE care. As the article states, government time servers will always figure out how to game the system to their benefit. The trick is figuring out how to rig the system so that the result of their gaming the system results in good service for those that are supposed to be served. We have such a method already. It's called capitalism. Good service providers get more business, bad service providers get less. Only in a government controlled system can bad service providers thrive, because we customers don't have a choice about where our money goes. The incentive to provide excellent service is gone, since the customer has no option. Incentives work. When the economic incentives to be excellent and the penalties for being lousy are removed, only an idiot would think that the product/service being provided won't trend towards being lousy.